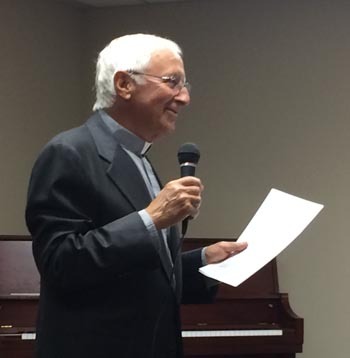 Dr. Alfred Mauriello’s path to becoming a deacon began with a lost child. After coming home one day from his Exton medical office, Mauriello – an ear, nose and throat specialist – learned that a toddler from a neighboring town was missing. A lapsed Catholic, Mauriello was moved to make a deal with God. The child was safely returned to her family, and that weekend Mauriello scrambled to make a Sunday afternoon Mass at West Chester University’s Newman Center to keep his promise. Curious, he picked up some reading materials at the campus chapel, and was surprised to see that they were in English, rather than the Latin of his childhood Catholicism. Drawn to rediscover his faith, Mauriello began attending daily Mass and, along with his wife Sue, became active in his parish. He eventually discerned a call to the permanent diaconate, to which he was ordained in 1999. On July 25, Mauriello shared his journey, along with his thoughts on integrating faith and work, at a theology on tap session hosted by SS. Peter and Paul Church in West Chester. Mauriello, a member of St. Maximilian Kolbe Parish in West Chester, described the challenges that have shaped his faith and his ministry. Given his decades-long estrangement from the church, he would initially have seemed an unlikely candidate for ordination. “My rejection of God became stronger until I found myself to be the judge of what is right and wrong,” Mauriello admitted, noting that he had begun turning away from the faith as early as age 12. Despite his doubts, Mauriello was never completely cut off from his Catholic roots. He graduated from both La Salle College High School and La Salle University. Before finishing his medical studies at Thomas Jefferson University (now the Sidney Kimmel Medical College at Jefferson), Mauriello married his wife, then an Episcopalian, at a service presided over by a Catholic priest. The couple’s three children were baptized as Catholics, even though the family did not practice the faith. Scripture played an important role in confirming Mauriello’s call to the diaconate. Already busy with family, career and parish activities, and daunted by the one-year diaconate application process, Mauriello was hesitant to respond. Inspired to read the Book of Jonah, he found confirmation of his vocation in the reluctant prophet’s miraculous second chance to fulfill God’s command. “I prayed to God to touch my heart and not my mind,” Mauriello said. Prayer is vital to maintaining faith while on the job, Mauriello observed. He expresses gratitude to God while performing difficult operations. He also asks patients, particularly those dying of cancer, if they believe in God. Mauriello once called a priest friend to assist a patient whose pastor would not give absolution. Eucharistic adoration enhances the ability to blend faith and work, Mauriello noted. He reminded attendees that God is always in the tabernacle, and that prayer can simply be an awareness of the divine presence. Being receptive to the Lord enables us to endure the rigors of work, which is a fundamental dimension of our daily lives. Mauriello, whose father was a teenaged factory worker, pointed out that Jesus himself labored as a carpenter with a continuous awareness of God’s presence. Mauriello’s talk resonated with attendees such as Erin Regan, a critical care nurse at Children’s Hospital of Philadelphia and a parishioner at St. Joseph Parish in Ambler. “I can relate this to what I do in helping sick children,” Regan said. 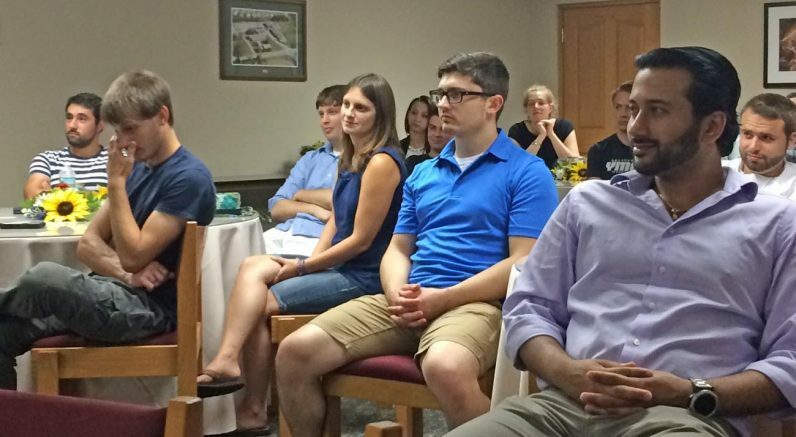 Mauriello urged his audience members to realize their potential through faith in action. No one, especially a Permanent Deacon, has the right to countermand the judgment of a confessor in the Sacrament of Penance. What the penitent said in Confession and what the confessor said are not known to anyone else. Privately, certainly not published for all to read an implied criticism of a confessor and pastor no less, a person may assist a penitent in a manner that shows obedience to the Church and respect for all priests, The added factor of cancer of the penitent does not affect the matter. The state of life and title of a Permanent Deacon give him no right to do other than perform the duties imposed by his bishop and pastor, and to make himself available in order to relieve his pastor for preaching and other priestly work. Priests never criticize or put down Permanent Deacons in the slightest way; they are always generous and gracious toward them. This Permanent Deacon has not similarly honored the priesthood, to which he owes his lofty position in Holy Orders.